Dunfermline have completed the signings of three new players, including former Hearts defender Austin McCann on a free transfer from Notts County. 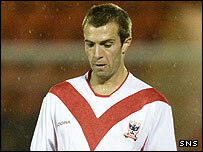 McCann, 28, has penned a two-year deal, having agreed a pre-contract with the Fife club earlier in the year. Midfielder Graeme Holmes, 24, who started at Dundee United, joins from Airdrie United for the next two years. Stirling Albion midfielder Steven Bell, 23, also joins on a two-year contract, which was agreed in January.